Despite four days worth of intensely concentrated buzz on social media, the Turkish uprising from Gezi park and surrounding Istanbul barely rated a mention in the US mass media market. By Saturday evening, there were more than 200 active demonstrations across 67 Turkish cities, but that only warranted a short flicker on the front of CNN’s website at around 11 o’clock Saturday night, and that was the end of it. The protests were swallowed in the great maw of distraction and neglect that often greets news events on this side of the Atlantic, even if they’re happening here. The Monsanto protests over Memorial Day weekend were equally ignored, for example, despite a great deal of colorful activity. After all, how many demonstrations have bee “die-ins” in the middle of DC, complete with yellow and black striped youth folding over themselves in mock convulsive deaths? How many protests are international in scope, touching over 400 cities in 52 countries across the world? Not to be outdone, the US media equally ignored the Blockupy protests against the ECB in Frankfurt over neoliberal austerity measures, and the hundreds of thousands of citizens converging on one of the oldest cities in the world to defy a ruling party that has tried to turn the last green area of Istanbul into a shopping mall. All three of these events have somehow avoided the attentions of our ever hungry mass media market. All three of these events are also connected in another way: they are all, at bottom, protests against a neoliberal economic order whose ‘free market’ orthodoxy ignores the will of the people. In their effort to disregard the obvious, the Turkish media has outdone even US media’s best efforts. Turkey’s version of CNN displayed cooking shows and happy penguins while the streets of Istanbul were filled with tear gas and water cannons. The US might be forgiven for not covering the Turkish uprising with as much interest as the protests against the WTO in Seattle, but Turkey can hardly escape blame. Reports of 3G networks being blocked and internet access throttled to a crawl, coupled with a vicious police presence that has killed two and injured thousands– many deliberately—bring to mind the worst acts of Mubarak’s regime in Egypt. So much has been used in the way of tear gas and a strange ‘orange’ gas that activists have a new nickname for Prime Minister Tayyip Erdogan: Chemical Tayyip. 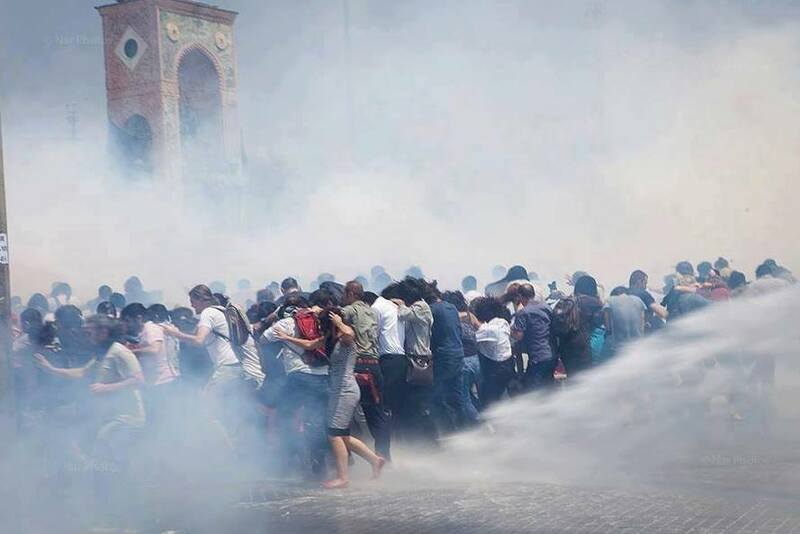 In fact, there are reports that the police have used so much tear gas that Istanbul’s police force has had to ship in more from the nearby city of Bursa. As of Sunday evening, June 2nd, the situation escalated and there were reports of live ammunition being fired against activists in Antioch. But that’s more wishful thinking than the full story. As Jason Cassano reports at Jadaliyya.com, Erdogan’s plan for Taksim Square’s redesign is part of an overall neoliberal turn the party has taken. According to Cassano, this protest is the latest manifestation of a movement that has been stirring for some time now. The initial seventy or so folks who camped out at Gezi park called themselves a ‘Right to the City’ movement—and what they are, in the best sense of the word, is a Democratic movement to ensure that the people who live in the city and are affected by the machinations of the ruling party, have their voices heard. Occupy Wall Street and Occupy the Hood in the US could talk in great length about such plans, and how devastating they are to the communities involved. But if it’s not a bunch of environmentalists, and not a secular versus religious/traditionalist struggle, what is it? The struggle in Turkey is not only about environmentalists concerned with the green space or the manifestation of secular vs. religious tensions, it’s about people of a region controlling the destiny of their public spaces, their commons—controlling if there will, in fact, be any public spaces left, or if every last inch of societal space will be given over to private profit. It’s Occupy Wall Street coming to Istanbul, with love. Let’s hope Istanbul’s ‘Right To The City’ movement–and the hundreds of thousands of activists that have joined them– holds tough and, in the process of struggling to save Gezi park, they start to transform the way such decisions about urban blight and renewal get made: not just in Turkey, but all around the world.